The European Central Bank will eventually be forced to cut interest rates or risk an even deeper recession that could test the eurozone again by inflaming political and social tensions, American economist Nouriel Roubini has warned. The ECB last week decided to hold interest rates at a record low of 0.75%, what they've been since July, even as it predicted the eurozone economy will shrink in 2013 by almost as much as last year and inflation will fall further below target. A small minority of economists had predicted a rate cut, arguing that last month's Italian elections and the darkening economic outlook could sway the ECB. On Friday, during a visit to Ireland, International Monetary Fund managing director Christine Lagarde kept up the pressure, saying the ECB had room to cut rates further. The bank would act eventually to avoid the recession getting worse, but risked doing "too little, too late," Roubini said in an interview with CNN's Nina dos Santos. "They have to cut the policy rate, they have to stimulate the economy, they have to try to weaken the value of the euro," said Roubini, who was credited with predicting the financial crisis of 2008. The euro rallied from $1.20 last July to $1.37 last month as talk of eurozone disintegration subsided after the ECB announced it would backstop weaker members and the European Union agreed to create a permanent bailout fund. It has since fallen back to around $1.30, in part due to concerns about the impact of political deadlock in Italy. But it is still proving a headache for exporters particularly in southern Europe. "The euro should be 10, 20 or even 30% weaker to restore the competitiveness of the [eurozone] periphery," Roubini said. 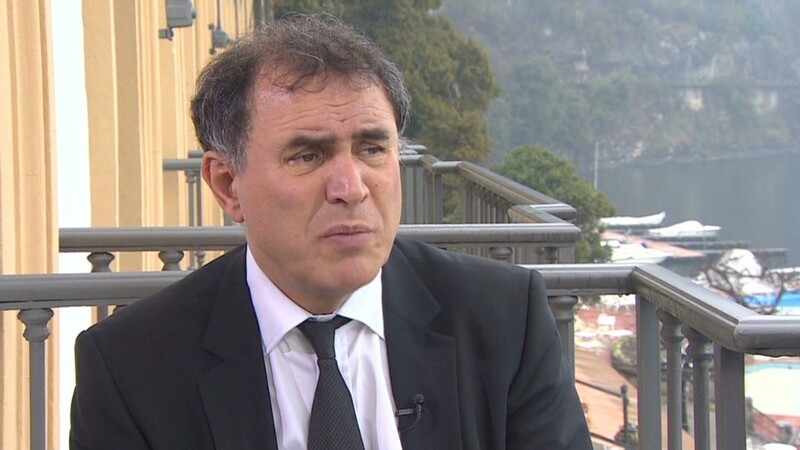 With all the world's major central banks using "unconventional" methods to throw money at their economies, Roubini said the ECB could not sit on the sidelines while political tension mounts. That tension is reflected in the Italian protest vote against austerity, and in resentment about the cost of bailouts in Germany and other northern states. "If they are the only [central bank] holding out, then the damage economically and politically will be severe," he said. "The risk is there will be a clash between austerity fatigue in the periphery of the eurozone and bailout fatigue in the core -- the two could clash in a way that could put at risk again the entire eurozone system."